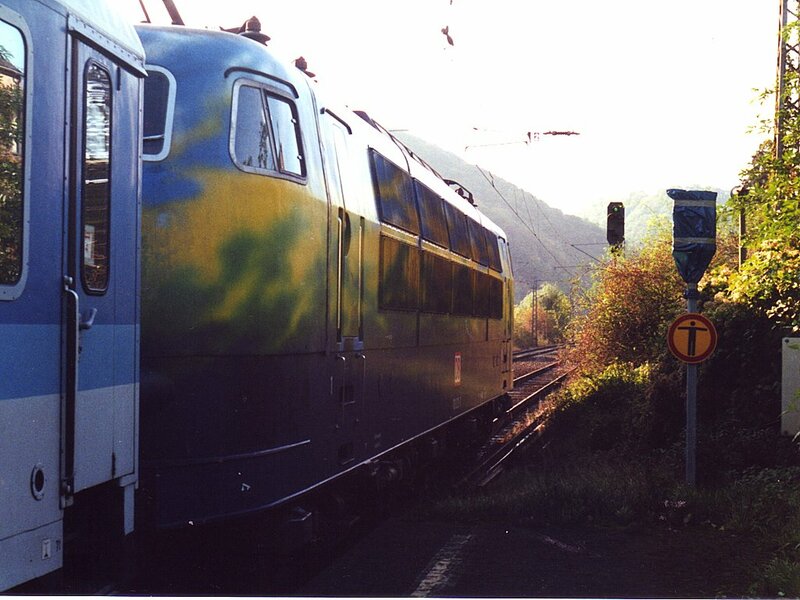 The strangely liveried 103 220 heads west from Winningen (Mosel) with a seasonal 'wine train' on 26.10.01. At this point the train was ECS - they didn't plan it that way, but it was! Instant drama at Telford as 0746 Salop was advised as 14 late for my 14 minute connection! Snap decision to take 0735 Wolves despite being told by the booking clerk that I wouldn’t get to Crewe until 1023. Correct decision, as 0808 CT to Liverpool got me to Crewe in time to watch the Shrewsbury train arrive… After an hour watching trains, on to Manchester Airport in an FNW 323. Check in took about 10 minutes (why did BA say 2 hours) and lots of Worthington was consumed with PR while awaiting the flight. The 737 left on time, arrived 15 early and we were away on the 1603 S-Bahn to Düsseldorf Hbf. EuroDominos purchased, we repaired to Uerige for 2 altbiers and a weissbier, then on to Zum Schlüssel for a further altbier. On to Dortmund on an RE (very crowded, stood to Muhlheim, or was it Essen), and booked in at the Sport Hotel, unspectacular but perfectly adequate and handy for U47. Evening meal, quite superb, was taken at Zum Altenmarkt with 2 x Thier Pils and rounded off the day nicely. Not surprisingly, a good kip was had! Breakfast at 0700 suited well for a short walk and the 0726 tram to Dortmund Hbf. 0753 Trier was ready and waiting with 103220 on mostly IR stock. A leisurely trundle to Essen Altenessen waiting time at all the stops, the one at Gelsenkirchen providing a phot stop for various British cranks. Route then was on to the freight lines just west of Essen-Dellwig, then parallel with passenger lines until just before Oberhausen. Diveunder line to Oberhausen West Yard and along the south side of that, then diveunder again to Duisburg Meiderich Ost, and parallel to the Ruhrort branch. Then north to Moers over a freight only Rhein bridge. More surprises at Rumeln where we took the diveunder line and remained on the freight line all the way to Krefeld-Linn, thence via the Krefeld ‘avoider’ to Meerbusch-Osterath. That was the end of track pro tem; to avoid reversal in Köln the route is Neuss-Köln-Troisdorf-Neuwied then across the river and (successfully) via the Koblenz avoider to Winningen (Mosel) which was reached about 5 late due to an errant IR. Being by then the only passengers, we were treated to a train announcement in English. A long trog round Winningen was eventually rewarded with a very pretty town and - better - a pub selling Gaffel Kölsch. The RB back to Koblenz was 4 late but we just made it on to IC610, 1237 to Köln, 101 powered. This was 5 minutes late but still allowed time for a quick visit to P.J.Früh’s. 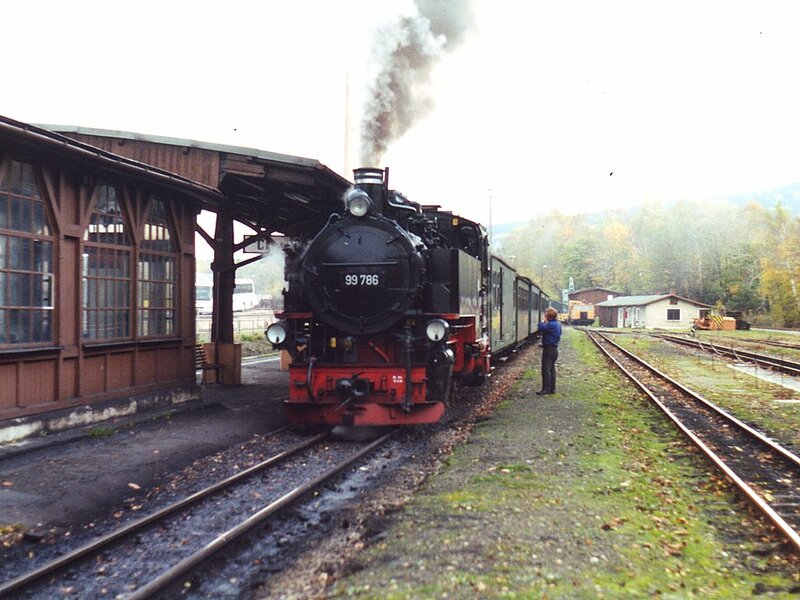 0-10-0T 94 1538 waits at Sohlingen-Ohligs with one of a series of specials round the Remscheid loop on 27.10.01. The reflections on the side tank of the loco show just how bad the light was on a very rainy morning. Gummersbach has now gone over to Talent karts (it was 218s when I last went), and very full ones too. Gummersbach is a sizeable town with bus station conveniently sited opposite the railway station, and a pub next to the bus station. Ersquelle Pils was the offer of the day. The 301 bus turned up on time and relieved us of DM9.80 for the 55 minute ride to Olpe, again a sizeable and prosperous looking town. Another nasty low floor kart, single unit this time. What’s happened to all the real trains? A very pleasant ride down the Bigge valley to Finnentrop with road above the line on a couple of stretches. There is a system of reservoirs/lakes large enough to sustain two fair-sized pleasure boats. Arrival at Finnentrop was in P5a which does have booked main line services in both directions. Another new unit, this time electric and with fearsome acceleration, took us down to Hagen where arrival was just about within technical daylight (1840). Daylight was fine until the junction with the Iserlohn branch anyway! Hagen seemed fairly desperate - featureless modern shopping centre with a pub found for food eventually. Rotten service, poor food and the only redeeming feature was the Hövels Bitterbier which lived up to its name and vaguely resembled an English bitter too. Very pleasant; shame about the rest. Poor breakfast too – no ham or wurst. Possibly the wurst breakfast… Off to Hagen Hbf rather thankfully for the 0731 to Solingen-Ohligs, wide shouldered double deckers hauled by 111 147. At Solingen-Ohligs there was much crank-related activity and a kettle simmering nearby. Foolishly we ignored these portents and took the 642 to Solingen Hbf, a more run down and depressing location than which it’s hard to imagine. The sensible option seemed to be to return to S-Ohligs (particularly having noted the ‘0855 Sonderzug’ displayed thereat). This we did, arriving despite late-running kart in time to throw ourselves into an ancient but ‘refurbished’ (new varnish) 4-wheeler once based at Erfurt. The loco was 0-10-0T 94 1538 which, unlike the karts, seemed to have no problem with the wet rail. It made good progress when allowed, but there were numerous delays due to trains going the other way, trains going the same way, and trains generally. It made it round the loop OK however, and after a brisk run from Wuppertal-Oberbarmen was only 2 late back at Solingen-Ohligs. Obviously nothing to do but go to the pub - there wasn’t one, so while PR reviewed the crankfest I hastened to the supermarket for supplies of Hasserode and Kölsch. I needn’t have hastened so much as the 1128 IC to Hamburg, 101 powered again, was nearly 10 late. The connection at Dortmund (IC922) was held and arrival at Hannover was more or less on time. The bratwurst man has been evicted from the posh new subway but it was still available and very nice too, if a bit steep at DM4. The IR to Magdeburg was 10 late but delivered us early enough for a mad dash to get the 1603 to Dresden (IR2039, 112 108 leading). This lost time in a steady if unspectacular fashion. It did however use what S&W show as freight line from Wiederitzsch, and went over the flyover to Leipzig-Mockau. Is this a diversion? I think we should be told. [Certainly looks like one]. Eventual arrival at Leipzig was 18 late. 218210 (blue/cream) was noted on 1826 to Chemnitz. A reasonably prompt change to 112156 helped and by Dresden Neustadt we were down to around 5 minutes late and with a 6 minute stop booked there we were only a minute or two late at Dresden Hbf (high level, west side). A book F Kursbuch supplement and a CD-ROM were procured at the travel centre enabling us both to check tomorrows times; PR’s changed somewhat, mine apparently (!) not. Good meal in a Whitbread steak house but the pub situation was so desperate that we ended up in the bar at the Ibis (Königstein, despite having a reservation at the Bastei, but who cares). Rather a hot and noisy night, despite and because of leaving the window open. Remembered the clocks have gone back - just! The usual comprehensive Ibis breakfast, and none the worse for that, preceded a visit to the Reisezentrum to discover that Schöna(Gr) to Usti nad Labem cost DM10.20. 0741 to DD-Flughafen was waiting in P9 - (yet another) low floor kart, which took the southernmost track out of DD-Neustadt. A smart new flyover takes the airport-bound karts over the Görlitz line after DD-Klotzsche (which has been rebuilt). Hopefully it’s not a Niederwiesa situation and we’ll do the ground level curve going back. Grenzstrasse has also been rebuilt and has a loop, currently closed because the track has subsided. It looks very much as if it’s subsided into the subway. The rest of the branch to the airport is single line, almost all in tunnel. The airport station is the usual 2 platform cavern; the airport terminal seems to have enlarged substantially since H and I were here in 1996. On the return the ground level curve was indeed done. It appears that the physical junction for the ‘down’ (to airport) line is west of DD-Klotzsche and for the ‘up’ it’s east. Back at Neustadt things went pear shaped as usual with 0900 IR to Leipzig (originating DD-Hbf and going to Oldenburg) nearly 10 late. With a 7 minute, 9 platform connection at Leipzig this was unhelpful. 112 156 was pushing and pootled gently along half way to Riesa before getting a bit more purposeful. Arriving at Riesa at 0940 it was still 9 late so I took a wild gamble that they’d hold 0940 to Falkenberg. They did. The 0940 is a desperately slow RB with a 5 minute stop (and change of train numbers) at Falkenberg. This enabled it to clear any residual lateness from its 4 minutes late departure from Riesa. As well as several 232s and motley sparkies, stuffed and mounted 52 5679 was noted on its own bit of track at Falkenberg depot. It needs a coat of paint. Endless trog to Rosslau (Elbe) taking the southernmost (sic) line at the junction east of Meinsdorf, and Dessau with arrival on time at 1145. 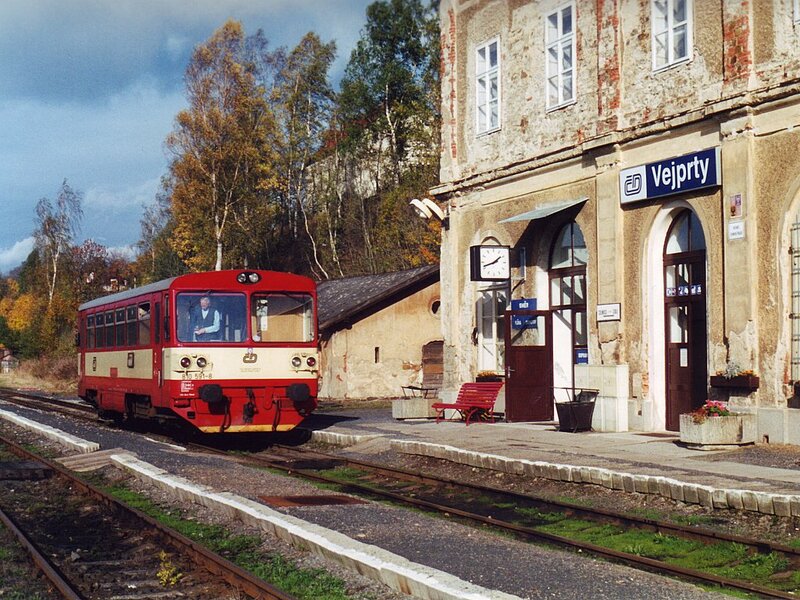 The Wörlitz branch platform was quickly located; it’s actually part of the main station but has no connection from the subway or booking hall so you have to go outside and walk 100m or so. 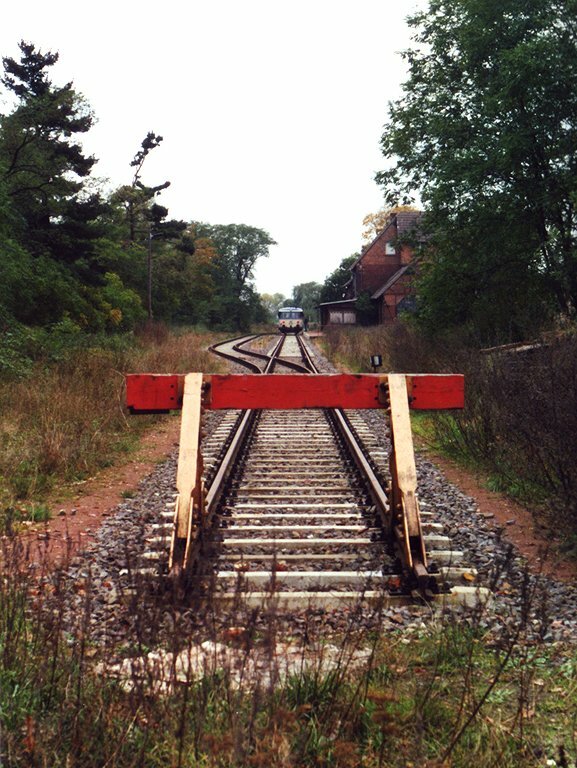 The branch crosses the DB goods line on the way out - it looks as if the former Wörlitzer Bahnhof is now used by freight. It’s quite a surprising line, with the first part winding through fields, odd bits of industry and lots of trees! Just before Oranienbaum there’s a siding, apparently military or ex-military and the line then takes the west to north side of a triangle which seems to have been in the middle of a military camp and still has some flat wagons on one side of the triangle (all three sides are in place). At Wörlitz there is a large 17 th century English style (or so it says on the board) park with a system of lakes and canals presumably fed from the Elbe. Excursion traffic to this is (presumably, again) the raison d’être for the branch service. My train (ex DKB Ferkeltaxi) took 9 passengers out and brought 3 back, of which I was the only ‘out and back’ one, not surprisingly. On the return I was able to get a look at the ‘military’ wagons, which appeared to be dumped, and the ‘military camp’ which could very well have been a factory. Perhaps I’ll find out one day. Back at Dessau there was just time to get a bottle of pop from the shop before Rabbit 218427 arrived with 1400 to Aschersleben. I dived into the front coach to be entertained with RabbitSound as far as Köthen, where 218432 provided further entertainment by hurtling out to Dessau with a carriage door open. 1435 IR to Halle (ex Oldenburg) made up for its opposite number’s failings this morning by arriving at 1430, 3 minutes early. Into Halle 3 late after two engineering delays and looking forward to a beer, to find the whole station in upheaval, subway bar closed, non-mayo sandwich stall gone, general misery. Retired hurt and thirsty to 1522 RE to Eisenach, hopefully stopping at Großheringen though not advertised to do so. Immediate disaster: bustitution Naumburg - Großheringen. I dived off at Merseburg intending to return to Halle - nothing until 1622 which will no doubt be delayed as it’s supposed to come from Eisenach. Hopefully I can still get 1659 IR to Dresden. At least the Merseburg station buff’s open and Freiberger Pils is improving the hour a bit. 1659 IR was indeed made OK, the RE being close to time. 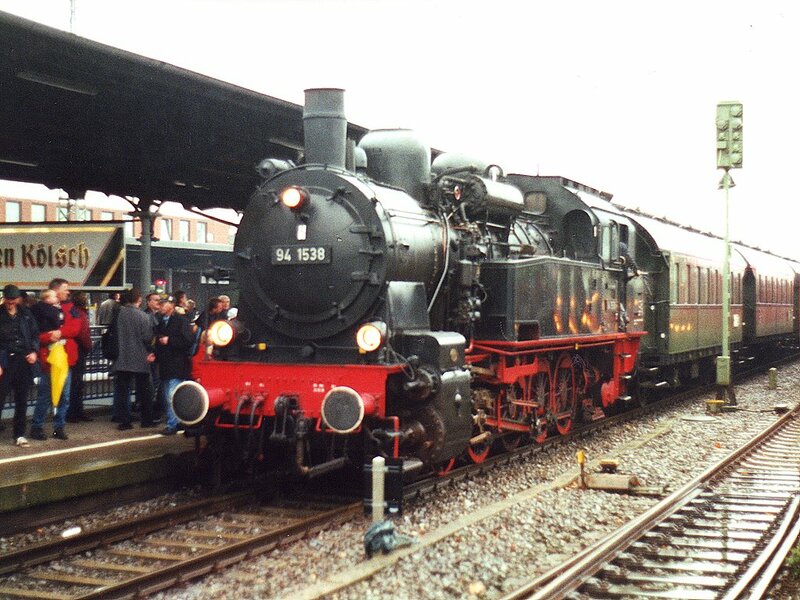 It trundled serenely to Dresden apart from a minor pathing problem at Riesa, arriving on time at Dresden Hbf at 1907. With PR eventually appearing from Zittau about 2020 a satisfactory meal was had in an upstairs pub, of which the name escapes me. At least I got overlap. ČD's 810 591 stands at Vejprty on 29.10.01. This is a border station - beyond the 810 the line goes into Germany. Civilised start for 0800 Dresden-Praha IC, formed of IR stock except for the first class, and a Czech loco (163 100). There’s such a long stop at Bad Schandau it couldn’t help but be on time but a late connection made us 5 late from De čin. The lengthy engineering works between De čin and Usti must be allowed for, as we were still only 5 late at Usti, allowing an easy cross platform connection into 0940 to Chomutov. This went via Bohosudov, Teplice, Oldřichov, Bílina and Most. Chomutov proved not quite as desolate as I’d feared with the station buff happily dispensing Louny Premium (5.1%) which went down immensely well. The branch to Vejprty was fully up to expectations with serious climbing and scenery similar to the Potučky - Karlovy Vary line. We passed 742167 on freight (empty) at Kovářská. Arrival at Vejprty (pronounced Vayperty) was on the easternmost track and appeared to give overlap. The photos will reveal all (the unit had moved forward about its own length after we disembarked unfortunately!) It turned out to be a short walk down to the border (10 minutes) and a nearby pub provided Velkopopovický Kozel for next to nothing. Fichtelbergbahn's 2-10-2T 99 786 at Cranzahl later in the afternoon, when the cloud had arrived. Return to Chemnitz by Schienenersatzverkehr to Wolkenstein and then a 642, was enlivened by a bottle of Dampflokbier purchased at Cranzahl. An excellent nosh was taken at the Ratskeller, nearer and better than the Schnitzel Paradies. Up betimes for the 0652 to Leipzig, hauled by Rabbit 218213 with 219054 hung on the back. A short pause for photography (PR) and timetables/Nimms Mit (me) before 0851 to Weißenfels. The glad tidings arrived just before Großkorbetha that the bustitution was still on at Großheringen so after consulting the parish notices at Weißenfels and finding it would drop us back 2 hours we turned tail and retired hurt on a Frankfurt - Binz IR to Halle and a Leipzig - Passau IC (101107 hauling) to Hannover. Frantic replanning eventually produced a reasonably constructive result. Off at Braunschweig on to a Berlin-Stuttgart ICE as far as Hildesheim, thence an electrically pushed RB (141365) then an RE to Hannover (110488). All trains to/from Lehrte appear to use P7 at Hildesheim (and nothing else does) however it’s a loop so all is not lost. Route into Lehrte was via the north side of the flyover into the north side of the station. P3 has some Hildesheim departures which presumably do the south side of the flyover; the P14 ones presumably don’t. S-Bahn alignment Lehrte - Hannover is separate - and it splits just west of Lehrte. Schöfferhofer Weizen was taken in the Zapfhahn at Hannover Hbf and a bulk purchase of bratwurst obtained before the 1256 to Hameln, a packed low floor electric kart which arrived at 1340. Straight on to the 1345 to Paderborn, the whole thing being fairly slow and tedious. The branch to Bielefeld via Hövelhof was the last daylight track of the day, again packed and less than interesting. By the time we left Bielefeld on the Eurobahn low-floor kart to Lemgo (E/Domino dubiously accepted) it was dark. Lemgo provided us with warm Herforder Pils and a rotten meal in the Ratskeller. Hotel was adequate (Hansa, DM85) for the price, and it must be said it’s a wonderful little town with 16th century buildings everywhere, as promised by the Rough Guide! A fairly leisurely start for 0807 to Bielefeld (no grippage, so EuroDomino status is still not clear). A lovely fine morning turned wet and windy later on as the Berlin-Nürnberg ICE made its way to Duisburg. PR decamped at Hamm to go to Düsseldorf via Wuppertal and I stayed with the ICE hoping (in vain) for a -1 minute connection to Xanten at Duisburg Hbf. A visit to the Reisezentrum for supplements was met with amazement, even when I showed them the Book F supplement! Nothing for it but to wait a further 50 minutes to go to Xanten. A 103, possibly 110 or 170, was noted on IR2235 to Münster. Minor drama on 1110 to Xanten which paused for 20 minutes just south of Moers due to (I think) a signal failure. A light 232 eventually appeared followed by a second announcement, and some applause, and eventually we went. Despite the driver’s best efforts we were 16 late back at Duisburg, in time to miss the 1254 RE to Düsseldorf. An IR at 1303 stepped in and eventual rendezvous with PR at the entirely admirable Schumacher’s at 123 Oststrasse was only 5 minutes or so later than the intended 1330. Onward journey to the airport was on foot to D-Hbf and then the 1445 S7 to D-Flughafen Terminal. Punctual flight back to MAN with BA - enjoyed the G&T, shame about the tuna and cucumber relish roll! Time for an overpriced and under-cared for pint of Landlord before dispersing, in my case for 1747 CT to Notts. Uneventful return home other than a skirmish with a CT conductor at Crewe who shut the doors in my face despite having had his train announced as a platform alteration less than 30 seconds earlier! And that, I thought, was it for 2001. But no, another short notice closure came up and I was off to - surely not - Germany again.